If you're looking for big dietary calcium boosts, milk products lead the way to better nutrition. Aside from fortified cereal, dairy sources dominate the high-calcium foods list. You can select various mineral concentrations, calorie counts and fat contents of different foods made with milk to achieve your daily 1,000 to 1,200 milligrams of calcium. 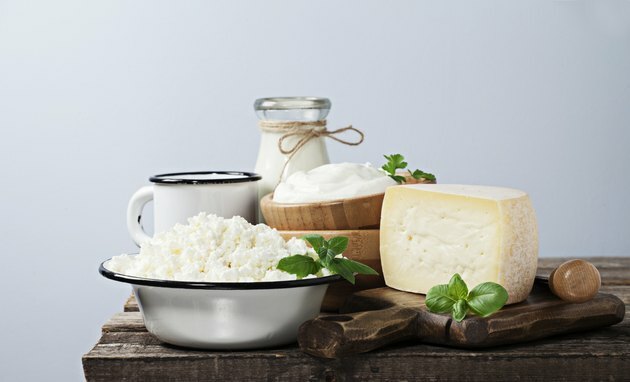 Base your choices among varieties of yogurt, milk and cheese on how well your body digests lactose, or milk sugar, as well as your weight and health priorities. Canned condensed and evaporated milks have the highest calcium ratios of all dairy products, but may not be the best sources for daily consumption. People use these rich forms of milk, from which much of the water is removed in processing, in cooking or as additions to other beverages, such as coffee, tea and hot chocolate. Although 1 cup of sweetened condensed milk has 869 milligrams of calcium and nonfat evaporated milk has 742 milligrams of calcium, you may be more likely to dilute them than to drink them full strength in that quantity. One cup of sweetened condensed milk would deliver 982 calories, compared to nonfat evaporated milk's 200 calories. Ricotta cheese, a sheep's milk and whey product, is a more palatable high-calcium dairy item that you can eat as processed. You pay a high caloric price -- 339 calories for ricotta made from reduced-fat milk -- for its 669 milligrams of calcium per 1 cup. Whole-milk ricotta has less calcium and more calories from fat. Ricotta's short shelf life of eight days and richness may discourage its frequent use and consumption in large portions. Plain, fat-free yogurt represents a convenient, widely available, healthy choice for calcium nutrition. The live cultures in some brands of yogurt make it more acceptable than other forms of milk for people with lactose intolerance. One 8 ounce serving provides 452 milligrams of calcium, or about 45 percent of your daily requirement, in 127 calories. Additional fat or sweetener displaces some of the calcium content, so low-fat, whole-milk and flavored yogurts have less calcium value than nonfat varieties. The calcium in the milk and ice cream ingredients in milk shakes results in a high-calcium beverage that is also high in fat and calories. At 457 milligrams of calcium, an 11-ounce vanilla milk shake has 351 calories and 10 grams of fat. If you are watching your weight or limiting fat to reduce your cardiovascular risk, opt for plain milk instead. One cup of fat-free milk has 299 milligrams of calcium, zero fat and just 83 calories. Do Calcium Supplements Cause You to Lose Weight?